That psychotherapy works is a basic assumption of anyone who sees a therapist. But why does it work? And why does it matter that we understand how it works? 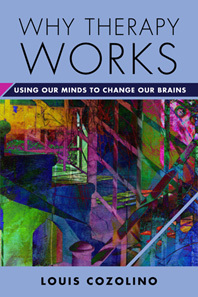 In Why Therapy Works, Louis Cozolino explains the mechanisms of psychotherapeutic change from the bottom up, beginning with the brain, and how brains have evolved—especially how brains evolved to learn, unlearn, and relearn, which is at the basis of lasting psychological change. Readers will learn why therapists have to look beyond just words, diagnoses, and presenting problems to the inner histories of their clients in order to discover paths to positive change. The book also shows how our brains have evolved into social organs and how our interpersonal lives are a source of both pain and power. Readers will explore with Cozolino how our brains are programmed to connect in intimate relationships and come to understand the debilitating effects of anxiety, stress, and trauma. Finally, the book will lead to an understanding of the power of story and narratives for fostering self-regulation, neural integration, and positive change. Always, the focus of the book is in understanding underlying therapeutic change, moving beyond the particular of specific forms of therapy to the commonalities of human evolution, biology, and experience. This book is for anyone who has experienced the benefits of therapy and wondered how it worked. It is for anyone thinking about whether therapy is right for them, and it is for anyone who has looked within themselves and marveled at people's ability to experience profound transformation.